Aldermaston Women have a letter published in the Guardian today on the day of the Serco AGM. Serco are one of the three companies who manage AWE (alongside Lockheed Martin and Jacobs Engineering). Channel 4's Dispatches programme, "Britain's Secret Fat Cats" reveals how SERCO are making a profit out of public service cuts. A street survey conducted by local environmental groups shows that a large majority of local people think that the proposed new Enriched Uranium Facility at AWE Aldermaston should not be built. Here you can find some stories relating to AWPC's Serco shareholder campaign. Now that nuclear submarine dismantling is to take place at Devonport & Rosyth, the MOD are committed to finding a site for the resulting intermediate level nuclear waste (ILW). In addition to making nuclear weapons, AWE partner Serco also runs detention centres. Last week they prevented Father Christmas from taking presents to children detained at Yarlswood. The rising trend in public-private-partnerships as a means of supplying public services is benefiting a handful of companies around the world. This is a short guide for women who want to know more about police powers. See below for a pfd of the Final Judgement by the Appeal Court, February 2009. See Articles for further background information. The decision on whether the Aldermaston byelaw criminalising camping on MoD land outside the fence will be heard on Thursday 5 February at 10.15 at the High Court (Strand, London). Dubbed ‘probably the biggest company you’ve never heard of’. 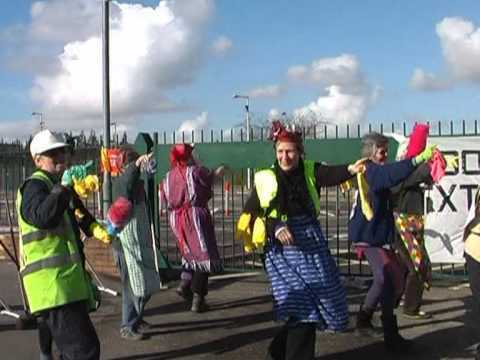 This Easter Monday - 24 March - marks the 50th anniversary of the first march to Aldermaston and CND have called a national "surround the base" event, with a broad range of groups participating.